In small bowl, soak raisins in 2 tablespoons rum for 30 minutes. Drain off rum into 1-cup glass measuring cup. Add enough water to make 1 cup liquid; set aside for bread batter. Heat oven to 350°F. Grease bottoms only of three 5x3-inch foil loaf pans with shortening; lightly flour. In large bowl, stir quick bread mix, reserved 1 cup liquid, oil and eggs 50 to 75 strokes with spoon until mix is moistened. Stir in soaked raisins and pistachios. Pour batter evenly into pans. Bake 40 to 45 minutes or until toothpick inserted in center comes out clean. Meanwhile, in small saucepan, heat sugar, 2 tablespoons water and the butter to boiling over medium-low heat, stirring constantly, until sugar is dissolved. Boil 3 minutes, stirring constantly. Remove from heat; stir in 1 tablespoon rum. Poke surface of loaves with toothpick. Brush top of each loaf with glaze. Cool completely, about 1 hour. Wrap tightly; store in refrigerator. 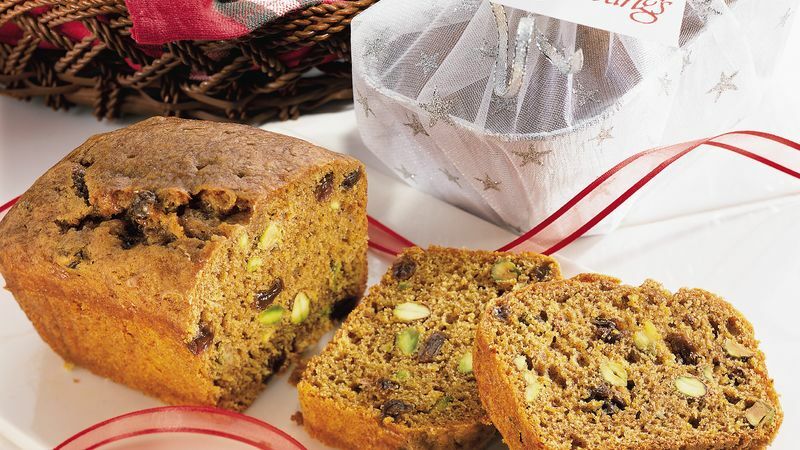 How about creating Pumpkin-Rum Macadamia Loaf? Just substitute chopped macadamia nuts for the pistachios; after glazing the loaves, sprinkle each with plain or toasted coconut for extra tropical flavor!